A-PDF Paper Manager Lite is powerful and lighting document imaging software to help you manage your paper documents with ease. A-PDF Paper Manager Lite is the leading choice for scanning, organizing, and sharing all your documents.With using A-PDF Paper Manager Lite, you can batch scan paper forms, invoices and bills into digital images or PDF files, you can also add relevant properties for the files. ...... , then you can search, group and manage your paper documents quickly in future. 2. Insurance Document Management Solution. 4. Check management in financial/banking industries. 5. Online Mechanical Drawing Viewer. A-PDF Paper Manager Lite is a completely self sufficient imaging system suitable for storing large volumes of documents, yet simple enough for computer novice to setup and use. * Scan paper into digital images or PDF files. * Group files with easy category feature. * Define properties such as amount, description, company. * Search files based on name, path, category, create time, etc. 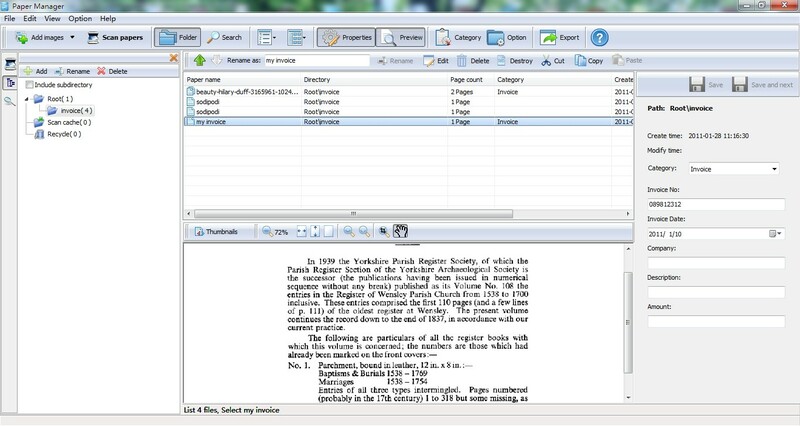 Qweas is providing links to A-PDF Paper Manager Lite 1.0 as a courtesy, and makes no representations regarding A-PDF Paper Manager Lite or any other applications or any information related thereto. Any questions, complaints or claims regarding this application A-PDF Paper Manager Lite 1.0 must be directed to the appropriate software vendor. You may click the publisher link of A-PDF Paper Manager Lite on the top of this page to get more details about the vendor.